A common difficulty witnessed by disability lawyers in Orlando, FL is the frustration experienced by disabled clients who very much want to work but have trouble finding employment suitable to their physical limitations. Earning disability benefits does not restrict a person to only one income source. It is both acceptable and recommended for people with disabilities to complete at last part-time employment to supplement their existing benefits. Staying independently employed is financially useful while also improving the emotional and mental stability of people who often struggle with fatigue and depression as a result of physical disabilities. Unfortunately, finding suitable employment in today’s economy can be difficult, worse still when physical disabilities prevent you from most jobs that require standing, lifting, or strenuous movement. Talk to a disability attorney in Orlando about any of these possible careers considered most suitable for people with physical disabilities. Financial institutions are one of the leading employers of workers with disabilities. Accounting, finance management, analysis, and consulting are all high demand fields that require very little physical exertion. Furthermore, many of these jobs can be performed with flexible working hours that will not interfere with any necessary therapy or doctor’s treatments. Pharmaceutical companies have shown a growing trend in hiring employees with disabilities for both sales and pharmacy technicians. Again, these jobs are some that require very little physical exertion, and a firsthand familiarity with the medical field gives workers with disabilities a unique advantage. Constant record keeping and medical transcription are also highly in demand in the medical field. It is no surprise that many who succeed in creating independent and financially stable careers despite physical disabilities later wish to share the knowledge they have gained. Physically disabled adults are often stressed by the confusion of doctor’s visits, medications, insurance paperwork, and hiring disability lawyers in Orlando, FL. Counseling helps provide resources, support, and advice the ease of burden of living with a disability. Many call center companies provide excellent insurance benefits and are more than willing to provide specialized seating and other amenities for employees in need. Some employers even offer work-from-home settings that provide added convenience for workers whose disabilities make it difficult to leave the house. As the assistant position, such as paralegal or doctor’s aid, would mostly be responsible for data entry and other clerical duties that require very little physical work. Some of these jobs require only a 2-year degree or an easily obtainable certification. Disability lawyers in Orlando, FL are often pleased to employ assistants with firsthand experience in order to better serve their clients. The increased demand for computer programming and coding has created employment opportunities for a variety of skill levels across the globe. Coding can be learned quickly through numerous training programs often provided by employers themselves. Living in the fast-growing digital era means that computer jobs are widely available with opportunities to work from home with very little inconvenience. 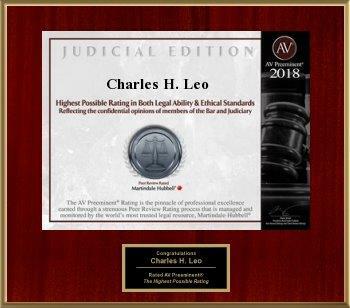 A Cocoa Beach, Florida native, Charles Leo is the main shareholder in the Central Florida based firm Law Offices of Charles H. Leo, P.A. The firm focuses on representing accident victims in their claims against insurance companies for workplace injuries and auto accidents. His extensive trial experience has led to trials in most statewide Workers' Compensation courts. Mr Leo has handled complex appeals before the First District and is AV Rated by Martindale Hubbell. Mr. Leo's free time is spend coaching or watching his children's sports activities, which include baseball, surfing & fishing. Charles Leo's passion and commitment to helping Floridians led him to start his own firm in 1997. The Law Offices of Charles Leo, P.A. has helped thousands of Floridians since January of 1997, and is committed to trying to help each and every client fight for justice.